The first pumped, completely artificial white water rafting course was the Nene Whitewater Centre. There are three pumps that control the water along this 300-metre course, which means that there is complete control over the difficulty level of the course and the skills that are required to navigate along it. There is a building at the centre that contains changing rooms and facilities for taking a shower after you have completed the course. There is also a cafeteria and many rooms that are often used for social events and conferences, making this a good team building destination. There is plenty of parking onsite for customers and there is disabled access. The centre is run on a not for profit basis by an organization called Clubs for Young People Northamptonshire. This group aims to encourage more young people to take part in leisure activities such as white water rafting, canoeing and kayaking. 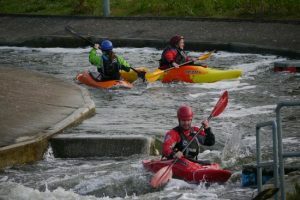 The raft guides are fully trained and experienced and when you go on one of the trips at the Nene White Water Rafting Centre you will be on one of the rafts with up to five fellow passengers. All passengers have a safety briefing prior to the trip. There is also the opportunity to practice the skills on flatwater before heading out to the rapids. The course here is ideal for beginners and all the equipment that you need including a wetsuit, helmet and paddle will be provided to you. The session will take around two hours to complete and only those aged 12 and above can take part, although a parental consent form is needed for those who are under the age of 18. On one of the sessions you can build your own raft and test that it will float. For some sessions, children aged 7 and above can take part.